Tiger Woods' comeback from the golfing wilderness to win the Masters overnight may dominate today's headlines, but the queen of the classics produced some epic comebacks of its own - all in 257kms. What better story than the victor's? At 34, Gilbert vacated his Ardennes chrysalis in 2017 to take his first ever Tour of Flanders, his cobblestone metamorphosis fully complete two years later at 36 with the raising of the coveted Roubaix trophy. He DNF'd last weekend's Tour of Flanders, his early season far from amazing. But did he panic? No. Philippe Gilbert (Deceuninck-QuickStep) proved the strongest after an attacking display over the pavé of northern France to win in a two-up sprint against Nils Politt (Katusha-Alpecin) on the famous Roubaix velodrome. "I was disappointed after Flanders, but in the week leading to Roubaix I returned to training and focused on Roubaix. I came into the race with pressure, because I was very motivated to overcome what had happened last Sunday and go for the win, especially as I felt that I had good legs. "It’s hard to believe what I’ve done today, it’s something really special and it will take a few days to realise what has happened and what I’ve achieved”, said the seventh oldest rider in history to win Paris-Roubaix." What pressure though? Who really had him as a favourite? He did! But that comeback of sorts is not the only reason he's here. Remember this? Just nine months ago, Gilbert was the owner of a broken knee cap. (Oh and let's not forget the kidney tear he picked up at 2017's Amstel Gold). L’incroyable histoire d’Evaldas Siskevicius (@Delko_MP_KTM) sur #ParisRoubaix ! Seul devant la voiture balai. Il crève. Sa voiture de DS est sur la dépanneuse ! Il change sa roue. Termine. Vélodrome fermé. On lui ouvre les portes. Respect. Last year, he needed organisers to open the locked velodrome gate to finish, (although technically a DNF) this year, Siškevičius finished ninth. With Zdeněk Štybar. "I am very proud of Elvaldas in this race which represents a monument of cycling," Delko Marseille Provence director Frédéric Rostaing said. "He took advantage of his perseverance that helped him finish the event last year to finish with the best this year. He deserves it!" The Lithuanian was undoubtedly pleased with his strong performance, only the second of five editions he has completed (80th in 2016). "I'm so happy! I would like to thank the team and Kévin Rinaldi (performance coach) who did a tremendous job so that I get to this event in shape. I wanted to show that sportingly, I could do something else. "The assistants shouted on the side of the road and Andy was crazy in the car. It really touched me." His fellow cyclo-cross star Wout van Aert showed at Paris-Roubaix why he wore a 'favourite' label going into the race, despite finishing 22nd. In the van Aert clip above you'll also see Inverell boy Heinrich Haussler rallying. While Double H didn't play the protagonist as the Belgian later did, Haussler beat him home, finishing 14th, and no doubt wondering "what might've been." “I had a flat tyre twice," the Australian said. "It was all about chasing today. Moreover with a strong headwind all day, I spent energies to bridge to the first group. "Too bad because I felt good." 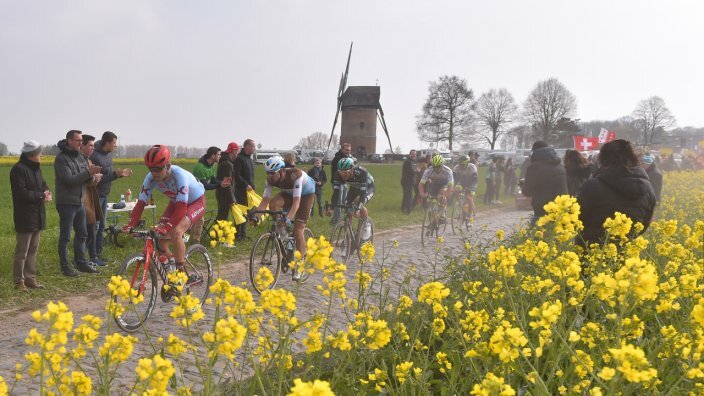 Perhaps drawing inspiration from his Delko Marseille Provence team mate's 2018 showing, Areruya was determined to finish his first ever spring classic, even if was outside the time limit. First Rwandan ever at Paris-Roubaix. Crashes. Gets back on. Finishes.